Blogher was fun. Blogher wasn't really what I expected, but it was a good time. It was a little like a college reunion, lots of smart women with a common interest. I got to meet people that I'd only known in the ether, like Sarah and Jen and Julie and Erika and Nora and Christine and too many more to list (and if I didn't list you, I'm sorry). I reconnected with Isabel, who I knew in a past life. I still don't know what the point of Twitter is, but I signed up anyway. I went to a couple of wonderful sessions, and a couple that were all jargon without much practical how-to. I scored some seriously sweet swag (including a bluetooth headset for my phone and a tattoo from the tattoed Cecily). And Susan made me weep. There were parties. And I know there were "parties" that the little people weren't invited to, but I got to plenty. The closing night party at Macy's was a little peculiar - champagne in bags, wine in shoes, and vodka in lingerie. 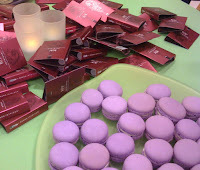 Alongside the lavender macarons in the lingerie department were samples of KY jelly - um, yuck? I promised Kelley that I'd take her to BlogHer, and I did. KC took a picture of Sarah and me with Kelley, which I don't have yet, but I got one with some chocolate, her other favorite vice. Would I go again? I don't know. The fact that it was in San Francisco, where I had a free place to stay and non-bloggy people to hang out with meant that it was lower stakes than it could have been. But the community aspect was great - it made me feel less alone. And that's nice. I'm glad you got something out of it! Sounds like you went in with just the right attitude! Glad you had a good time :-) I just met Erika last month at an ice cream social she organized...she's wonderful! it was wonderful to meet you and give you hugs. I'm so sorry I didn't get a chance to see you during my fleeting stopover. I'm feeling myself sucked into the twitter vortex in a BIG way. I might have to do it. Ack, I missed you there! I was running in and out a bit, driving home to nurse the baby since the breast pump thing wasn't working out. Next time, we shall meet! Glad you posted about it. I'm 70 miles and didn't go. I most curious if the sessions were worth it...what is it that they were about anyway...please explain. i loved meeting you, woman. btw, what's the twitter where my permission is needed? is that "sarah" me? i'm confused. Meeting your blog friends irl is the best. Damn! I missed the KY? I have SUCH a need for that in my life. Think I'm going to have to try it next year. I am making the BLogher recap rounds. I am glad you enjoyed it. It sounds way to scary for me, but you got to meet Sarah and for that I am envious. Welcome back. I was wondering if conferences like that are worth it...although a few days in a bed not occupied by three cats, a husband, and a turbo-charged Evil Genius might make any trip worthwhile. Hmm, chocolates and KY. I am trying to sort out why they would place those near each other...and drawing a blank. Avant guard I am not. I"m glad you had a good time but it reminded me of how I HATE conferences. I never feel more lonely than I do when I'm at a conference. It's kinda weird! I keep thinking I should go to blogher to meet fabulous women like yourself in person but hmmmmm. well, I'm just stoked that I got to see a picture of you. I guess I wasn't paying attention because I didn't even know you were going until you went. Sounds like it was fun. I have yet to meet any bloggy friends - it's very sad. Boy, I missed a LOT! Not only the Lavender Macaroons frosted with KY jelly, but also YOU. Glad you had fun! One of these years, I'd love to go. Aww, welcome back! Sounds like an (overwhelming!) blast! That sounds like so much fun...why not go to the next BlogHer? Maybe you'll decide only after they confirmed the location ya? hmm....I can't quite figure out what the BlogHer thing is, other than it makes me feel uncomfortably like I did in 8th grade when my friends all became friends with other friends while I was away for a few months...like I don't get it and am not part of something that I might want to be part of. The Macy's party sounds stranger and stranger the more I read about it. I'm a little sorry I stayed in that night now! I am not sure I would make one of the trips without someone I knew along. I was thrilled to meet you. I had a fabulous time at Blogher. Putting faces to words was a little weird, but good. I think. Macy's was very odd. I never did eat a single thing. Just. could. not. I did indulge in a sprite in the furniture department. C'est ca. That Macy's party was weird, wasn't it? BlogHer was lower stakes for me, too, because my best friend came along for the fun. Still, I met some lovely women, including you. Can I in the same comment write that I enjoyed meeting you (and then getting to chat in the halls) and wish I'd spent more time talking to you. A week out I feel more positive about the experience than I did at moments during the thing. I suppose that says more about me than the conference. I am glad you were there, too! I enjoyed meeting you and only wished I had had more time to talk. It is such a whirlwind and I was all messed up with the time zone change. I missed most of that weird Macy's party. It was so bright in there and I don't like shopping. I need to do more little gatherings next year so I feel like I get to spend time with people.